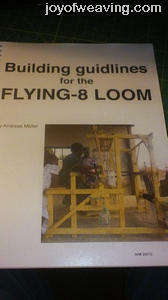 I first ran across Andreas Moeller's "Flying 8 Loom" several years ago and always wanted to get the plans to build one ever since. I was finally able to order the plans, thanks to visitors who purcahsed my DIY Horizontal Warping Mill plans, donated or used my affiliate links. The plans arrived within a week. If you're not familiar with Andreas' work, check out this series of videos about him on Youtube. I'm linking this image to his website where you may also purchase the plans. He has not only the plans, but also ways of hacking a loom into a Flying 8 (no affiliation, I just like his stuff a lot). We have to work outdoors since we don't have a garage or workshop so the project will have to wait until the weather improves next Spring/Summer. I've always looked forward to these season because I love to vegetable garden, but now I'm more anxious than ever!